Fresh oatcakes are something really special. When you take them from the oven they have a nutty aroma – something the pre-packaged ones never have. 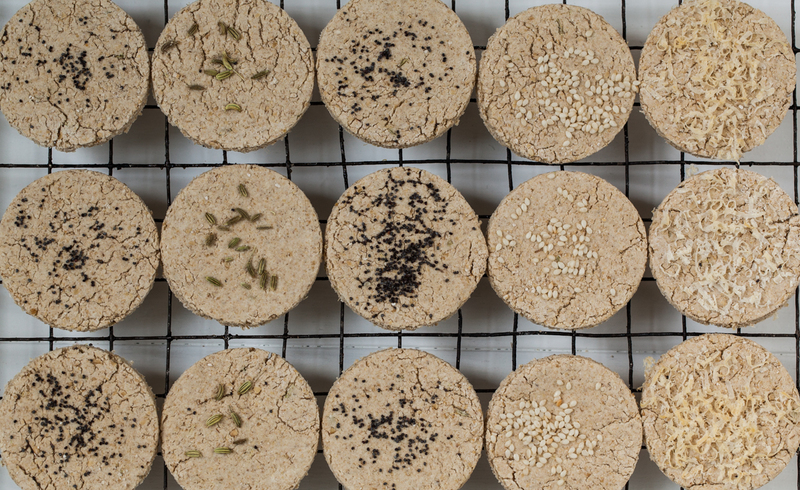 Once cooled oatcakes form crisp, yet crumbly platforms on which you can serve slithers of cheese or spread with dips or pâté. If you have a sensitive gut you should be able to manage three oatcakes for lunch. Using a mix of fine and medium oatmeal makes for a lovely firm texture but if you only have fine oatmeal that will do just as well but the texture will be slightly smoother. Combine the oatmeal, salt and baking powder in a bowl and then rub in the butter until there are no lumps left (use a food processor for this stage if you have one). Add enough hot water to form a soft ball of dough. Sprinkle a work surface with a little oatmeal and press the soft ball of dough with your hand to flatten it slightly. Sprinkle some fine oatmeal on a work surface and roll the dough to a rectangle 5 mm/ ¼ in thick. The dough may be a bit crumbly around the edges but don’t worry. Just gather any crumbs together and add a drop more water and roll out again. Cut out circles of dough using a 6 cm/2 ½ in cutter. Lift each oatcake carefully with a spatula or palette knife and place it on a baking tray lined with non stick baking paper. Place the baking tray in the oven and bake the oatcakes for 15 – 20 minutes or until they are tinged with a little brown around the edges. Remove the baking tray from the oven and carefully transfer the oatcakes to a cooling rack. Oatcakes keep well for a week in an airtight container. adding a tablespoon of poppy seeds, sesame seeds, fennel seeds or grated cheese to the dough before rolling out. If you need help managing your sensitive gut you will find more help at the IBS Network. 24 Jul	This entry was written by Joan Ransley and published on July 24, 2015 at 9:40 pm. It’s filed under Food on the go, Snack and tagged Black rice, low FODMAP, LowFodMap, Oatcakes, Oats, snacks. Bookmark the permalink. Follow any comments here with the RSS feed for this post. This sounds great. Two questions, how much of each ingredient should I use and if I have regular oatmeal (US style),do you recommend that I blend it fine or keep as is? Thanks. Hello Contented Belly. I am so sorry I left the list of ingredients out! They are in the post now. I find 150 g/ 5 oz fine oatmeal, 50 g/ 2 oz medium oat meal works well but if you only have one sort use that. It is a humble recipe that is quite forgiving. Try it out and see how you get along. The mixture can be a little crumbly but be firm with it! Good luck.